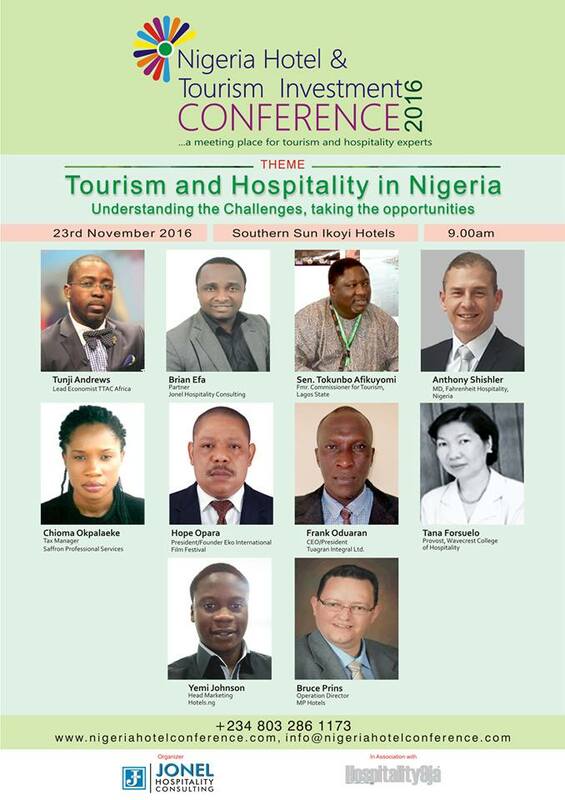 I Hope Opara will be speaking on “Film Festival as a tool for Tourism development”, Be our guest. For corporate organisations and professionals get registered. 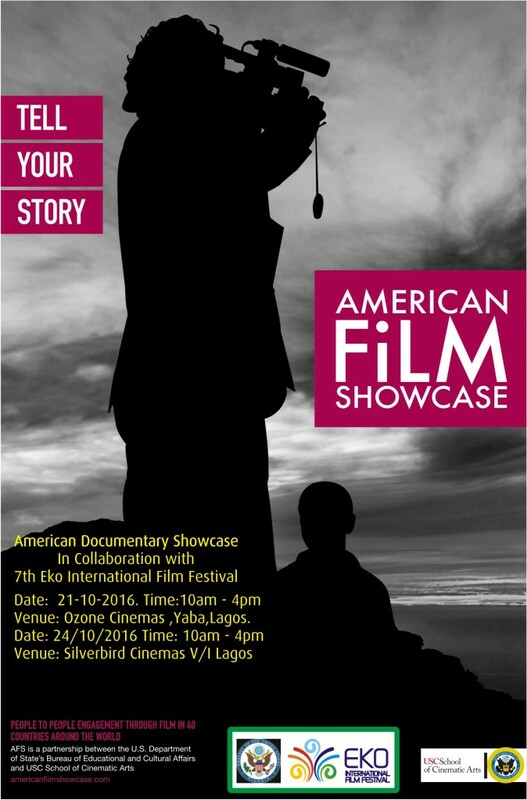 Eko International Film Festival is one of the largest film festivals to take place in Africa. It is a key part of our cultural infrastructure: they inspire audiences, artists, filmmakers and professionals from other parts of the world. Eko International Film Festival is the longest running independent film festival in Lagos and the 7th edition is slated to take place October 24-29, 2016.Eko International Film Festival recognizes excellence in film industry. 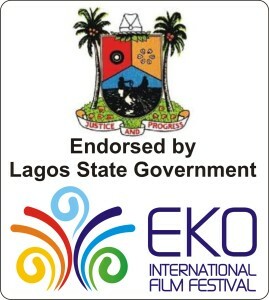 The Lagos State Government under the able and dynamic leadership of His Excellency Executive Governor Akinwunmi Ambode has endorsed the annual Eko International Film Festival. 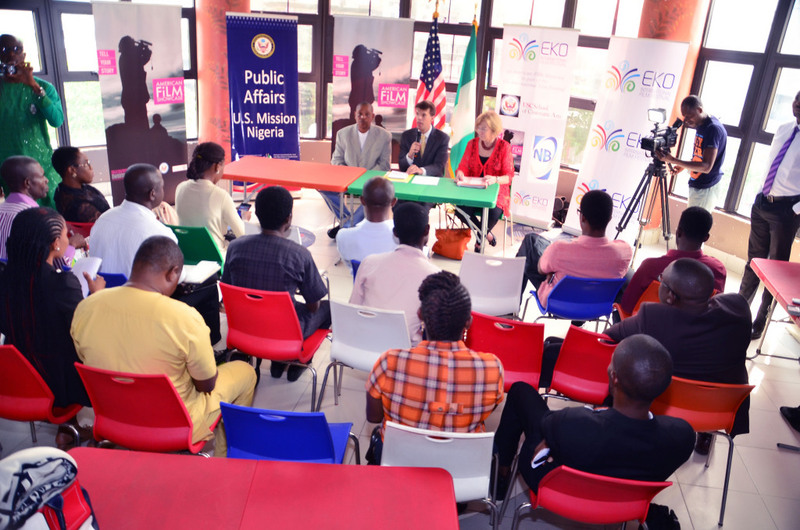 The 7th edition of the annual Eko International Film Festival is having collaboration with United States Embassy on American Documentary Showcase prior and during the festival. This collaboration with brooded the importance of using film as a tool for change in the society and also improve youth empowerment. 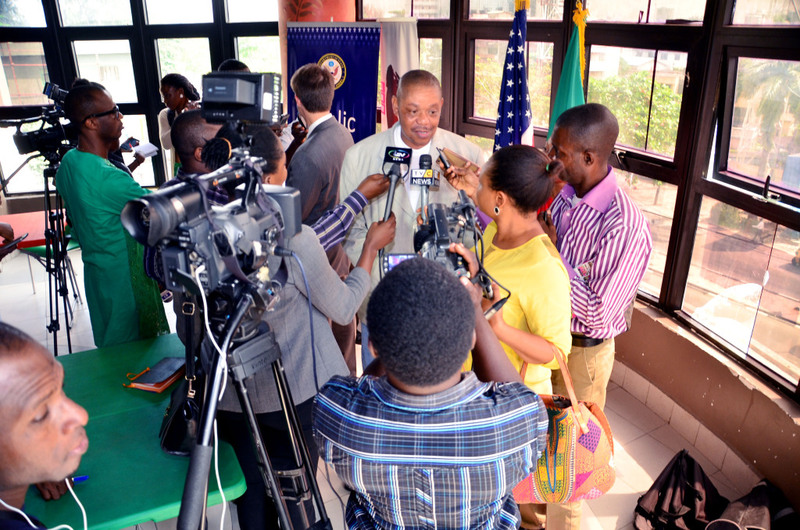 This program is a Program coming out from US State Department Bureau of Educational and Cultural Affairs (ECA). 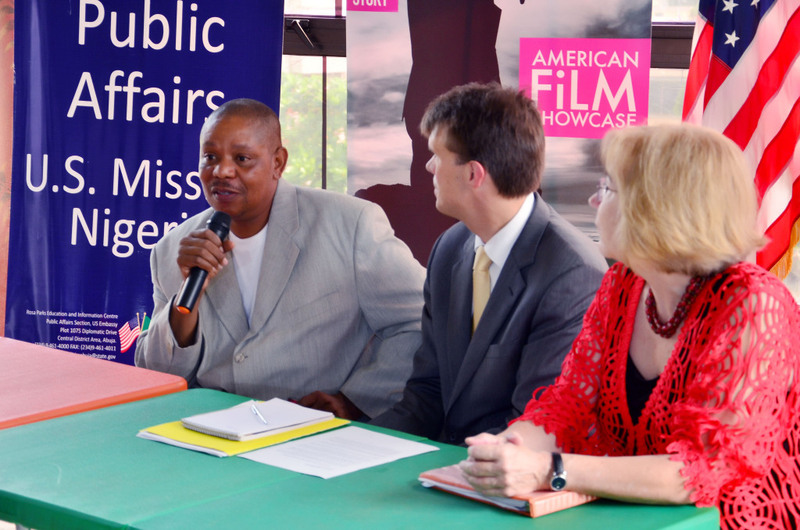 The American Film Showcase (AFS) provides a platform for both PAS and our partner organization to explore important themes such as freedom of expression, conflict resolution, civil rights, climate change, disability rights, economic development, and women’s empowerment, and through this program engage and empower key audiences, especially youth, and marginalized communities. The Film envoys team consists of two film professionals: A filmmaker and a film expert. The film maker would have made a featured film included in the AFS collection and the film expert is an experienced film maker, academic or film industry professional to handle the master class /workshops. The film envoys: the filmmaker of a featured AFS film, and an AFS film expert. Pairing a film expert with an AFS filmmaker allows the activities to go beyond screenings and Q&As to include workshops and master classes. This often deepens on the impact of the program in terms of conveying the power of filmmaking. The expert offers a distinct set of skills that the filmmaker may not possess, from providing a broader historical framework for the making and reception of documentary films to film fundraising, and can provide context and insight into the big picture of filmmaking. 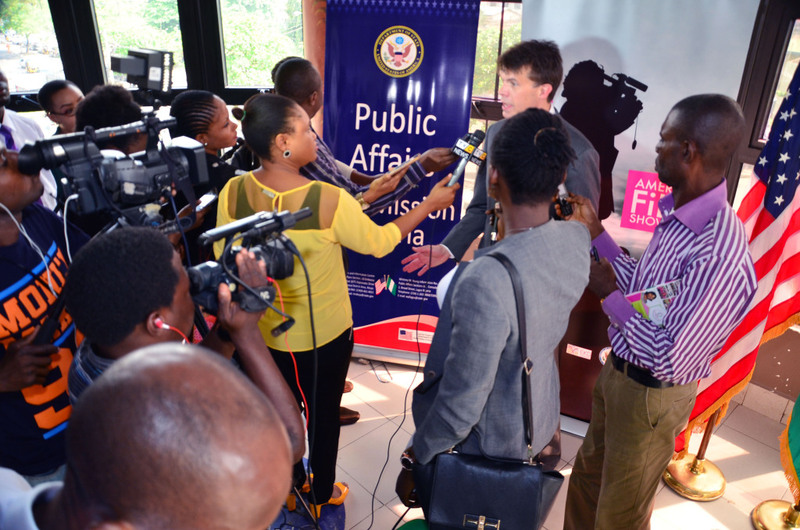 Countering violent extremism through youth engagements. 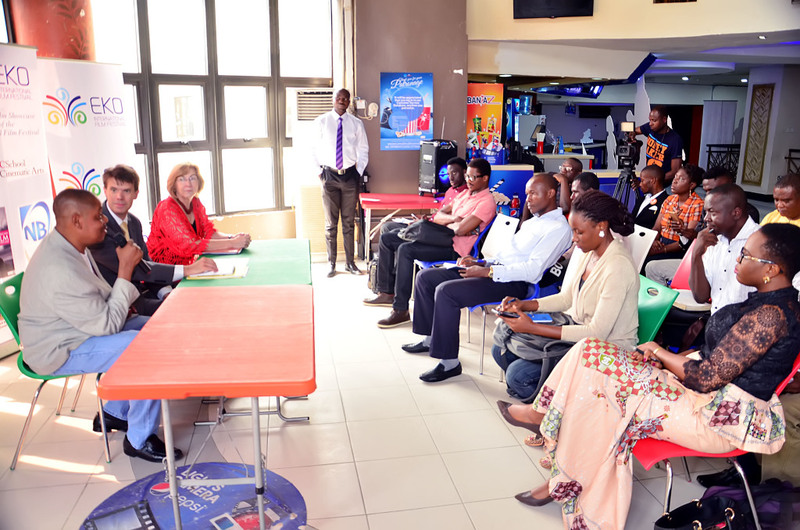 The programs will also include film screening and workshops centered on capacity development for the creative film industry in Lagos. Bearing in mind that millions of Nigerians who identify with the Nigerian film industry popularly known as Nollywood, and considering the size and diversity of Nollywood. University of Lagos Mass Communication and Theater Art. Yaba College of Technology students, invited guests including women and children to view and have an interactive session with the speakers. Students of the film department at Pan Atlantic University Lagos, women and the students of Holy Child Girls Secondary School Lagos. Several NGO are also invited to attend the event. Quest Speakers from University of Southern California Cinematic Department. 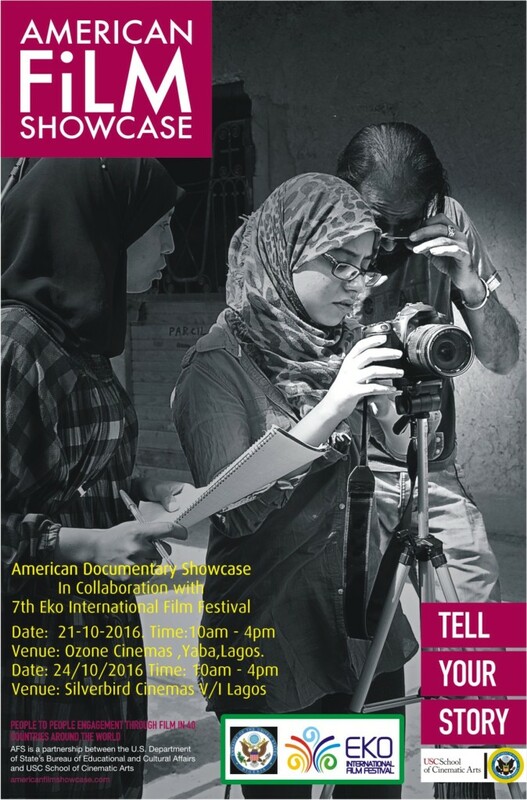 Everyone is free to attend this year’s American Film Show case. 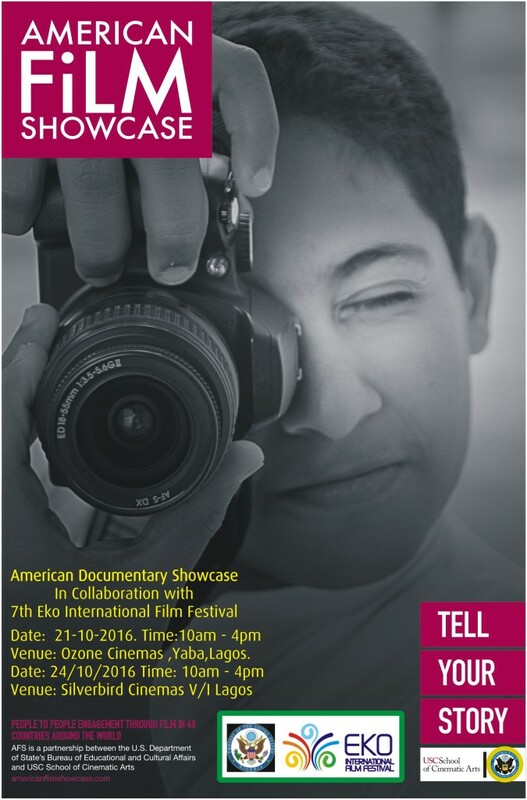 The 7th Eko International Film Festival program will continue after the documentary showcase at the Silverbird cinemas till the last day which will end with an award ceremony on October 29,2016. Here are the films (not arranged in priority order). Washington, DC, of the Philip C. Jessup International Law Moot Court Competition (the “Jessup”), the world’s largest simulated court competition. The “court” is the International Court of Justice (“ICJ”), the judicial arm of the United Nations. Against this backdrop, this moving film lays bare the struggles, triumphs and transformations they experience alone and together. Mr. Saunders is an Emmy-nominated and Peabody Award-winning filmmaker. He founded Cinema Capital in 1998, a production company based in New York City focused on realizing visual content from feature films to interactive programming. After a short-lived career as a professional soccer player, he got his start in film in 1993 working as a script reader at EMK Productions in Los Angeles working on behalf of HBO and TNT. Since then, Mr. Saunders has directed and produced fiction films, nonfiction films, series, commercials and Industrials as well as working with Fortune 500 companies on their brand strategies. His films have been selected at international festivals including the Berlin Film Festival, SWSX, IDFA and Thessaloniki Film Festival to name a few and acquired by distributors and broadcasters including Sundance, ARTE, PBS, Film Movement, IndiePix, ZDF, Film Movement, Netflix and SBS. His feature film GOAL DREAMS was selected as one of the top 10 ‘Movies That Matter’ by Amnesty International in 2006. In 2010, Mr. Saunders produced the feature fiction film ANY THING staring Greta Gerwig and Jonathan Zaccai, which premiered at the SWSX Film Festival. His current feature film, ALL RISE, follows the world’s largest international law moot court completion and is nearing completion. Mr. Shapiro has been working in the film industry for a decade after having studied documentary and film production at Clark University where he was awarded a fellowship by the Anton Group to produce a documentary in Ghana entitled LIKE ME, I AM HERE. He has specialized in international documentaries and recently released OPPOSITE FIELD, a film which chronicles a Ugandan Little League Baseball team. ALL RISE marks a natural progression in Shapiro’s career which allows him to explore his intellectual interests in the future of international law while employing his expertise in multi-country production. 2. I’m Not Racist…Am I? In addition to making films, Catherine develops short educational videos, curricula, and discussion guides to accompany all of Point Made’s films so that viewers can connect more deeply to the film’ subject matter. She also travels the U.S. leading workshops and facilitating dialogue about race and racism. She currently has in development an educational video series to accompany “I’m Not Racist… Am I?,” and she wrote and produced the “Adopted: We Can Do Better” video series for adoptive families – a companion educational program for the documentary “Adopted” that explores the unforeseen complications in transracial adoption. A BRAVE HEART follows the inspiring journey of 26-year-old, 63-pound Lizzie from cyber bullying victim to anti-bullying activist. Born with a rare syndrome that prevents her from gaining weight, Elizabeth “Lizzie” Velasquez was first bullied as a child in school for looking different. As a teenager, she was bullied online when she discovered a YouTube video labeling her “The World’s Ugliest Woman.” The film chronicles unheard stories and details of Lizzie’s physical and emotional journey up to her multimillion viewed TEDx Austin Women talk (#1 TEDWomen event of 2013) and follows her evolution as motivational speaker and activist as she lobbies Congress for the firs tfederal anti-bullying bill: the Safe Schools Improvement Act (SSIA). A native Austinite, Sara has held positions in media and entertainment including Executive Director of Interactive Marketing at Paramount Pictures, VP of Digital Marketing at MGM Studios, and CEO & Co-Founder of NowLive (acquired by Live Media Group in 2013) where she executive produced live events including The Hunger Games Premiere, Macy’s Fashion Night Out, and the Academy Awards Red Carpet. She was selected to attend The White House Women Entrepreneurship Conference in 2010, The White House Champions for Change Summit in 2012, and in 2012 and 2013 was nominated for Fortune’s Most Powerful Women Entrepreneur, and The Producer’s Guild of America New Media Council and Women’s Impact Network. Most recently, Sara moved back to Austin for the role of Executive Producer for the first TEDx Austin Women, which was the most viewed 2013 TEDx Women event worldwide. Sara is honored to be directing and producing A Brave Heart: The Lizzie Velasquez Story. Shalini Kantayya finished in the top 10 out of 12,000 filmmakers on Fox’s ON THE LOT, a show by Steven Spielberg in search of Hollywood’s next great director. Her sci-fi film about the world water crisis, a DROP of LIFE, won Best Short at Palm Beach International, and was broadcast on national television in the U.S. and India. A William J. Fulbright Scholar, Shalini has received recognition from the Sundance Documentary Program, IFP Spotlight on Documentary, Firelight Media Lab, Jerome Hill Centennial, New York Women in Film and Television, and the John D. and Catherine T. MacArthur Foundation. She is a Sundance Fellow, a TED Fellow, and a was a finalist for the ABC Disney | Directors Guild of America Directing Fellowship. Her debut feature, Catching the Sun, premiered at the Los Angeles Film Festival. Documentary director Laura Gabbert’s critically acclaimed films deploy full measures of humor and drama to unflinchingly put a human face on such difficult social issues as aging, the environment, and AIDS. NO IMPACT MAN, which the Los Angeles Times called “terrifically entertaining, compelling and extremely funny,” premiered at the 2009 Sundance Film Festival, and played theatrically in over 30 cities. Her previous film SUNSET STORY (PBS) won prizes at Tribeca and LAFF. About it, the New York Times wrote, “Sunset Story may break your heart, but it will also make your day.” Other credits include THE HEALERS OF 400 PARNUSSUS (PBS) and GETTING TO KNOW YOU (Sundance, Venice). Most recently, Laura directed and produced the feature documentary CITY OF GOLD about Pulitzer Prize winning food writer Jonathan Gold. The film premiered in competition at the 2015 Sundance Film Festival where IFC/Sundance Selects picked it up. City of Gold is now playing theatrically in over 40 markets. Laura received her MFA from UCLA’s School of Theater Television and Film. Interactive Conference, InspireFest, AT&T Foundry FutureCast, Dell Women Entrepreneur Network. Robin has been featured in national publications: USA Today, Wired, Forbes, Fortune, The New Yorker, The Atlantic, Fast Company, Cosmopolitan, Glamour, Marie Claire, San Francisco Business Times and has appeared on Bloomberg TV, CNN, NPR. Robin is the 2016 recipient of the National Women’s Political Caucus President’s Award for Exceptional Merit in Media. Lesley Chilcott is an award winning filmmaker, documentarian, and producer. She is the Chair of the West Coast Producers Guild of America (PGA) Non-Fiction documentary committee, and hosts popular PGA screening series The Doc Club. Chilcott got her start in film and production with MTV Networks. Before she made documentaries, she produced and directed hundreds of TV commercials. She was a producer of the 2007 Academy Award-winning documentary, AN INCONVENIENT TRUTH and also produced the amazing rock documentary IT MIGHT GET LOUD (2009) about legendary guitarists The Edge, Jimmy Page and Jack White. 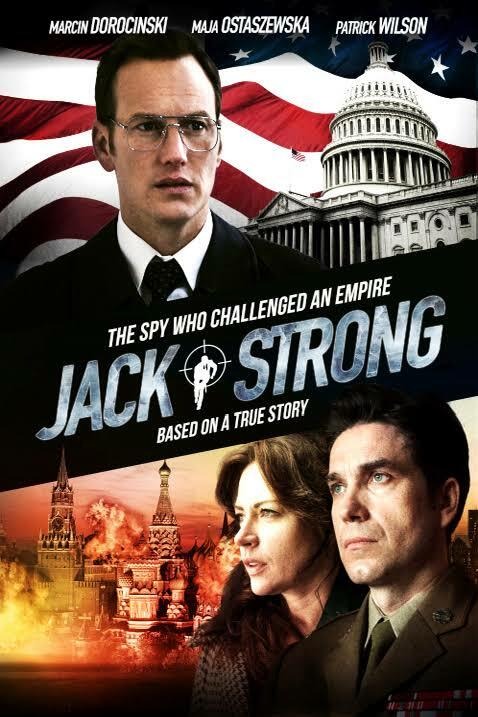 Other notable Chilcott-produced films include A MOTHER’S PROMISE, the Barack Obama biographic film for the Democratic National Convention in 2008, and WAITING FOR SUPERMAN (2010), for which she received an award for Outstanding Producer of Theatrical Documentary from the PGA. In 2014 Chilcott directed the feature documentary, A SMALL SECTION OF THE WORLD, about a village of women coffee producers from the Talamanca mountains of Costa Rica which played at the State Department of the UN in Geneva. The film also had and theatrical run and aired in 40 countries through Sundance International. Her short film CODESTARS garnered over 20 million views online and was the number one video on youtube.com for two days. Cheryl started her career producing award-winning, engaging stories for film and television. Excited by the limitless power of storytelling in the digital age, she founded Creative Breed in 2013 to create compelling content across all platforms to engage viewers and inspire them to act. Some of Cheryl’s credits include David O. Russell’s first movie Spanking The Monkey, winner of the Sundance Audience Award and Academy Award nominated documentary Children Of Darkness. From 2004 until 2011 Cheryl was Executive VP of Programming at Atlas Media Corp, a leading non-fiction production company, where she helped create and oversaw hundreds of hours of programming for many leading cable broadcasters including over 90 episodes of Dr.G: Medical Examiner, the top-rated show on Discovery Health and the hit Travel Channel series Hotel Impossible. Cheryl constantly pushes herself and her teams to create outstanding, innovative content that captivates and inspires viewers. Cynthia Wade won an Oscar and 16 awards for her 2007 short documentary FREEHELD, and was lead producer for the 2015 Lionsgate feature film adaptation of this film, starring Julianne Moore. Wade received her second Oscar nomination for her documentary MONDAYS AT RACINE (HBO) in 2013. Wade is the director of the documentaries BORN SWEET (17 film festival awards), LIVING THE LEGACY (Sundance & IFC Channels), GROWING HOPE AGAINST HUNGER (Sesame Street Prime Time Special, Emmy Winner), SHELTER DOGS (HBO, 5 festival awards) HEART FELT (shot in 5 countries) and GRIST FOR THE MILL (Cinemax). She is the co-director of GENERATION STARTUP (2016). She is currently directing television commercials for Procter & Gamble, Kimberly Clark, Unilever and Abbott. Wade is developing her first fiction film project to direct. 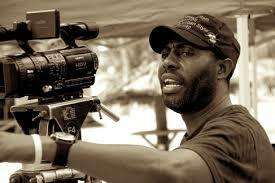 Wade has an MA in Documentary Filmmaking from Stanford University. In 3½ Minutes, Ten Bullets, two lives intersected and were forever altered. On Black Friday in 2012, two cars parked next to each other at a Florida gas station. A white middle-aged male and a black teenager exchanged angry words over the volume of the music in the boy’s car. A gun entered the exchange, and one of them was left dead. Michael Dunn fired ten bullets at a car full of unarmed teenagers and then fled. Three of those bullets hit 17-year-old Jordan Davis, who died at the scene. Arrested the next day, Dunn claimed he shot in self-defense. Thus began the long journey of unraveling the truth. 3½ Minutes follows that journey, reconstructing the night of the murder and revealing how hidden racial prejudice can result in tragedy. Carolyn Hepburn joined Motto Pictures in 2010 and was Line Producer on two films for Motto that premiered at the 2013 Sundance Film Festival: God Loves Uganda, shortlisted for the 2014 Academy Award for Best Documentary Feature, and Gideon’s Army, winner of the Sundance Film Festival’s Best Editing Award. She worked as the Production Executive of We Are The Giant, which premiered at the 2014 Sundance Film Festival and executive produced Art and Craft, which premiered at the 2014 Tribeca Film Festival and is shortlisted for the 2015 Academy Award for Best Documentary Feature. Hepburn produced 31⁄2 MINUTES, TEN BULLETS, directed by Marc Silver, which will premiere at the 2015 Sundance Film Festival. Hepburn is currently co-producing Ivy Meeropol’s new documentary Indian Point and The Punch directed by Andre Hörmann; and line producing the documentary Fellove, directed by Matt Dillon and Life Animated, directed by Roger Ross Williams. Prior to joining the Motto team, Hepburn produced a wide range of documentary projects for WNET, National Public Radio, and the United Nations as well as innovative experiential media for Spark Productions. 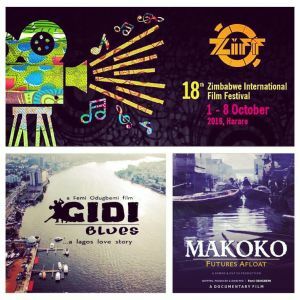 The Zimbabwe International Film Festival Trust announced earlier today that our films “MAKOKO – FUTURES AFLOAT” (Documentary) & “GIDI BLUES” (feature film) have both been selected to screen at ZIFF2016. To Harare we blow! Looking forward. 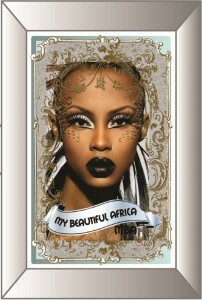 MY BEAUTIFUL AFRICA : FAST-FASHION & AFRICAN LIFESTYLE CULTURE. The brand aims to establish a very strong online retail presence to enable it capture its global marketshare.The fashionline which proudly reflects the colourful ethnic designs,afropolitan in nature, of the globally conscious but culturally defined African is set to carve a niche for itself in the fast growing African fast fashion Industry. Speaking on the brand, the founder/creative director Clara Chinwe Okoro says, we have access to the same international trends that the digital world has offered us all now the way it has offered other global brands and we aim to take advantage of that opportunity and create a truly global iconic African Brand. The fast- fashion model where the process from design to sales takes less than six weeks is greatly to our advantage she says, the retail industry is so dynamic now that it has become a lot more seamless to integrate whichever model you adopt to meet your customers demands. As with other iconic brands,M.B.A as its sound off acronym is pronounced aims to partner celebrities for collaborations and endorsements . With a very strong penchant to harness online retail opportunities, Clara believes that buyers are looking beyond electronics and gadgets to shop on e-commerce sites,the trend to buy clothes and accessories online would further gain momentum, one reason is that while a shopper would usually buy an electronic item or gadget once in a long time,say once in a year, those who purchase clothing and accessories would be doing this more frequently say once in a month. 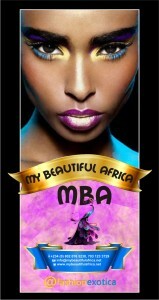 MY BEAUTIFUL AFRICA , the Label, planning its formal launch in September is already in high demand and also unveiling on different exhibition and fashion events across the African continent and in Europe. It is billed to participate in the Extoll Fashion Trade Fair in Almere Netherlands and also the Grand Fashion Mania Fashion Show in Cotonou. 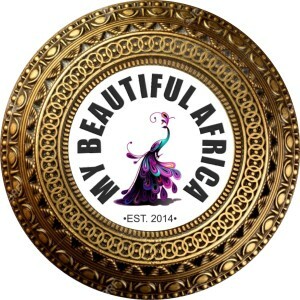 To cater to the growing fashion centric consumers across Africa by creating effortlessly elegant pieces that truly captures the true beauty of Africa,the brand is primed to elevate the lifestyle culture which young Africans are embracing and clearly defining in an an ethos which says,Yes I am African and am proud of it. 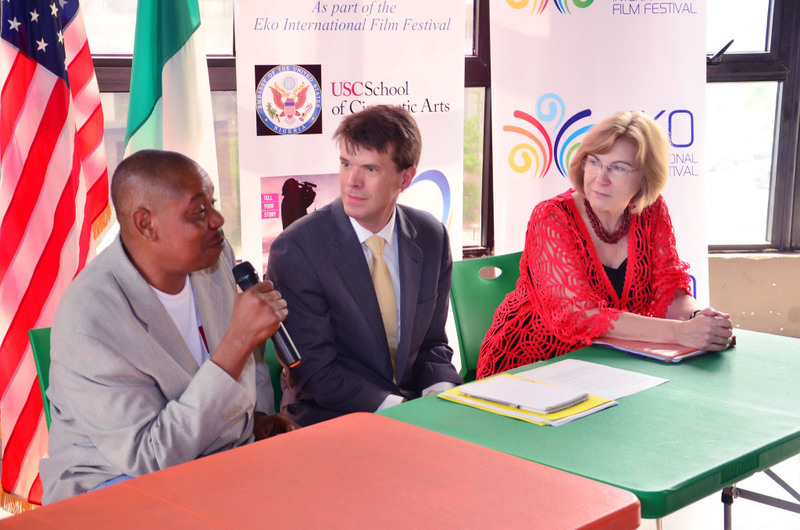 Eko International Film Festival Launch a Film Institute. 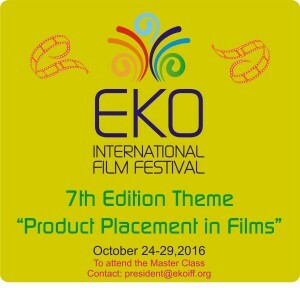 The annual Eko International Film Festival is to launch a film institute during her 7th edition coming up October 24-29.2016.The institute is billed to fill the gap between the new entrants into the Nollywood film industry and established practitioners. 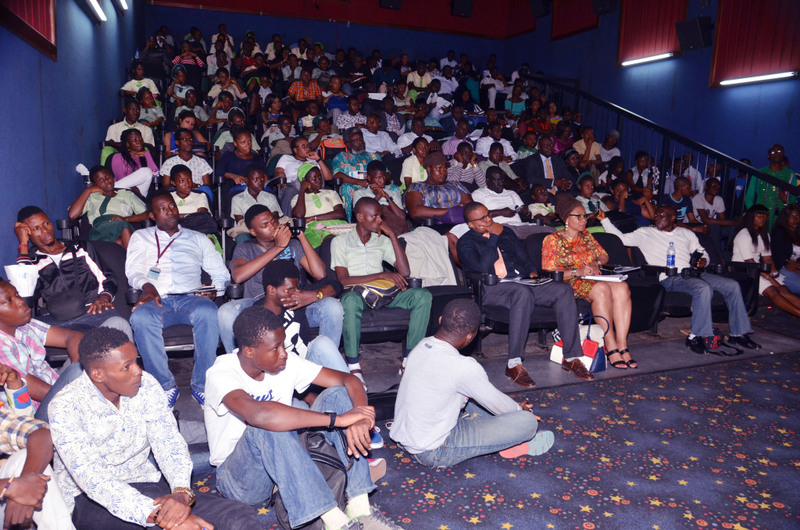 Youth development in art workshop: 7th edition Eko Int’l Film Festival. Our two-day workshop in youth development in Arts will be of immense benefit to our young generation. Arts can save lives. Arts can turn around a troubled teenager; get young men and women off the streets into creative and constructive pursuit. Art can change attitude, build self-esteem and redirect the path of wayward, art can also prevent despair. The workshops will engage young men and women into a more meaningful way to look inside themselves to rediscover their potentials. 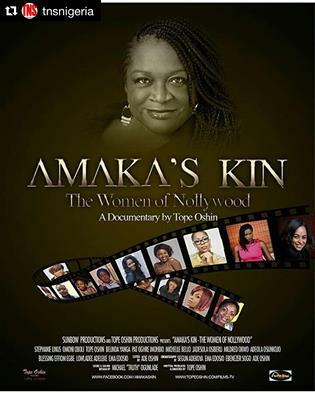 Dedicated to the memory of the late Nigerian Amazon Filmmaker and TV mogul, Amaka Igwe (1963-2014), AMAKA’S KIN chronicles the journey and challenges of female directors working within the Nigerian Motion Picture Industry popularly known as Nollywood.This documentary examines the careers of the very few female directors practicing in the very male dominated Nigerian film industry, widely known as Nollywood; their journey and pain,their joys and the challenges and hurdles they had to jump to become directors of film. 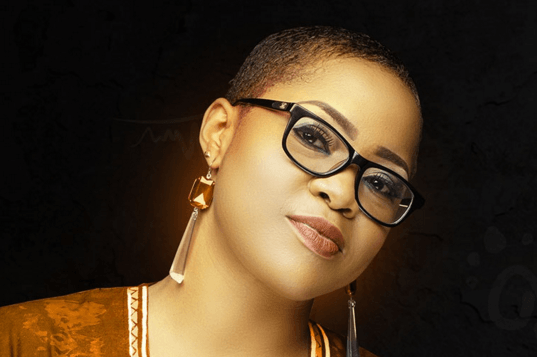 Mildred Okwo, Michelle Bello, Stephanie Linus, Omoni Oboli, Blessing Effiom Egbe, Pat Oghre Imobhio, Jadesola Osiberu, Adeola Osunkojo, Dolapo Lowladee Adeleke, Belinda Yanga Agedah, Ema Edosio and Tope Oshin. 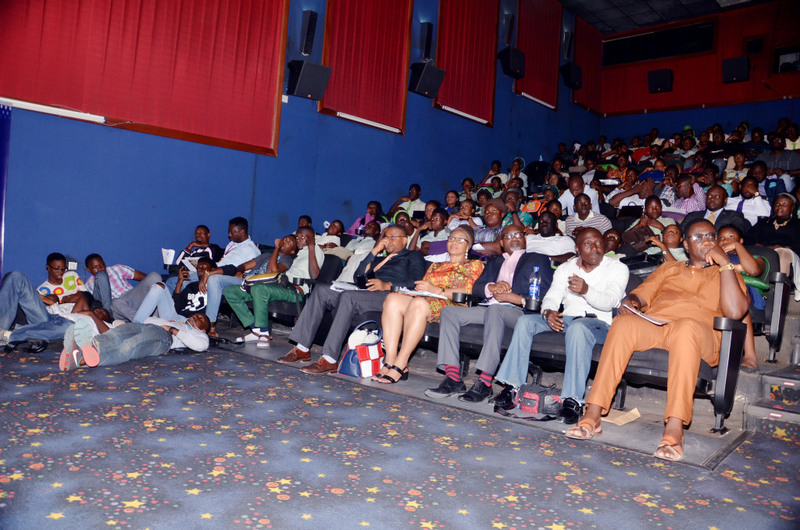 13th Abuja International Film Unveiled ….. The Abuja International Film Festival Called AIFF Is Today Nigeria’s Biggest And Longest Running Independent Film Festival In Anglophone West Africa Has Announced The Theme Of The Festival For The 2016 Edition. Previous Editions Of The Festival Had Witnessed Participation From Delegates From Over 20 Countries Amongst Them The United Kingdom, Ghana, South Africa, China, Japan, Niger, Usa, Poland, Togo, Burkina Faso, India, Dubia, Singapore. This Highly Reputed Film And Video Broadcast Festival Attracts Entries From Over 50 Countries Worldwide With An Attendance Of Over 6,000 Participants From The Film, Tv And General Public. The Abuja International Film And Video Festival Which Has Been Scheduled For The 4th To 7th Of October 2016 At The Prestigious Silverbird Galleria, Abuja. The Opening Ceremony Shall Be A Cocktail Event At The Silverbird Galleria Abuja On Tuesday 4th October, 2010 At 6pm. Over Films Will Be Screening At Multi Purpose Built Cinema Halls To Create The Cinematic Experience. At Last Count Over 300 Films Have Been Received From 41 Countries As The Deadline For Submission Approaches. 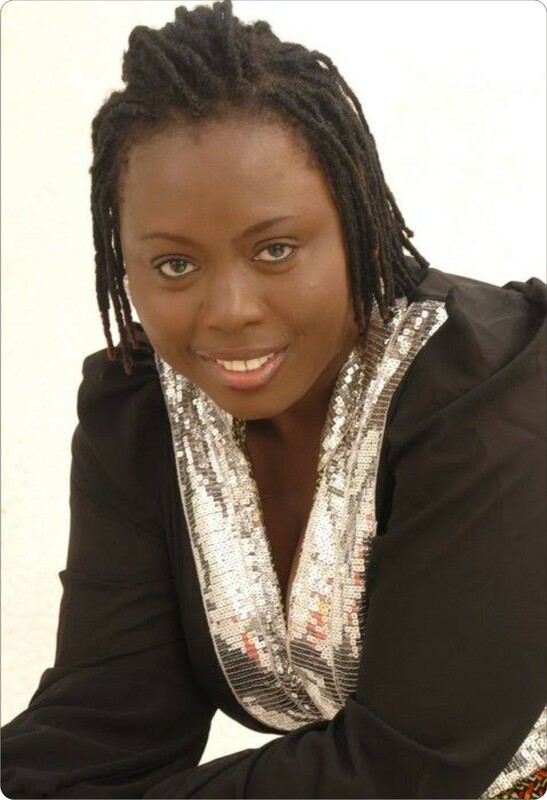 According To Temitope Duker, The Festival Entry Will Close On 31st Of July 2016. So Far The Influx Of Entries Have Been Encouraging. She also mentioned the inclusion of a new project called the Country Roundtable where Producers from different countries will pitch, discuss and network on collaborative projects. 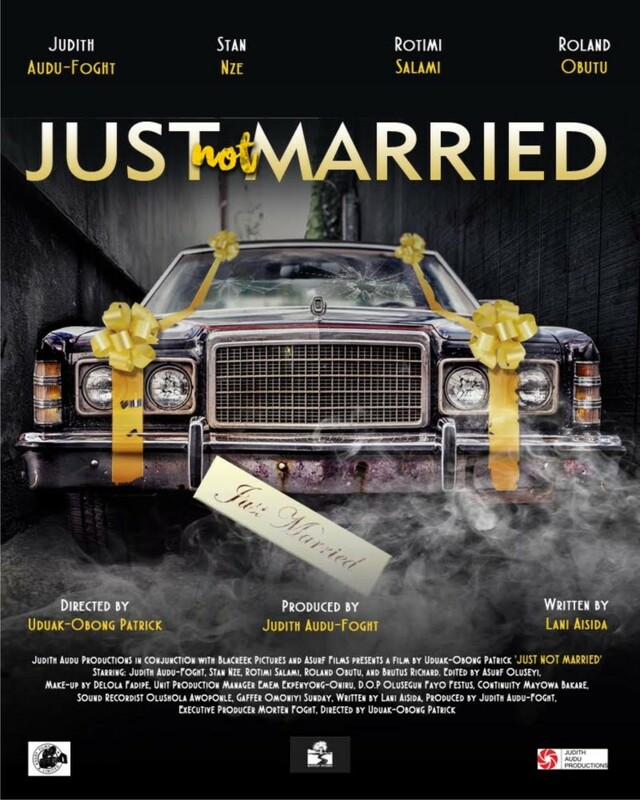 The Festival Is Organized In Conjunction With The Federal Ministry Of Information And Communication, The National Film And Video Censors Board, The Nigerian Film Corporation, The Nigerian Copyright Commission And The Nigeria Television Authority. As Part Of The Festival This Year This Year, Award Will Be Giving In 15 Competetive Categories With 5 Special Recognition Awards That Will Honor Excellence And Passion For The Creative Industry. Speaking Further Temitope Duker Promised That The List Of Those Individuals For The Special Recognition Award And Jury For 2016 Will Be Announced On 18th Of July 2016. .
We Are Continuing With Our Series On Youth Empowerment In Motion Picture Via The 20/20 Project Which Will Attract Students In The Universities Around Nigeria Attending Seminars And Workshops. They Will Also Be Made To Do Their Own Films. The Festival Has Concluded Arrangements With CANON To Run This Workshop In Cinematography, Photography And Editing Over One Week. Screening At The Festival Will Be 60 Local And Foreign Films, 1 5 Of Such Films Are Feature, 5 In Animation, 15 Short Films, 5 Experimental Films, 10 Documentaries And 10 Student Films. Of The Above Mentioned Films, 35 Are In Competition At The Festival, Gunning For The 15 Different Award Categories. Reiterating, Temitope Duker Promised That The Festival Will Incorporate A Musical Angle As There Shall Be Musical Performances From Some Local And International Super Star Acts. Also The Regulars At The Festival Like The Presence Of Members Of The Diplomatic Missions In Nigeria, The Festival Exhibition Market Shall Attract Over 60 Local And International Exhibitors. 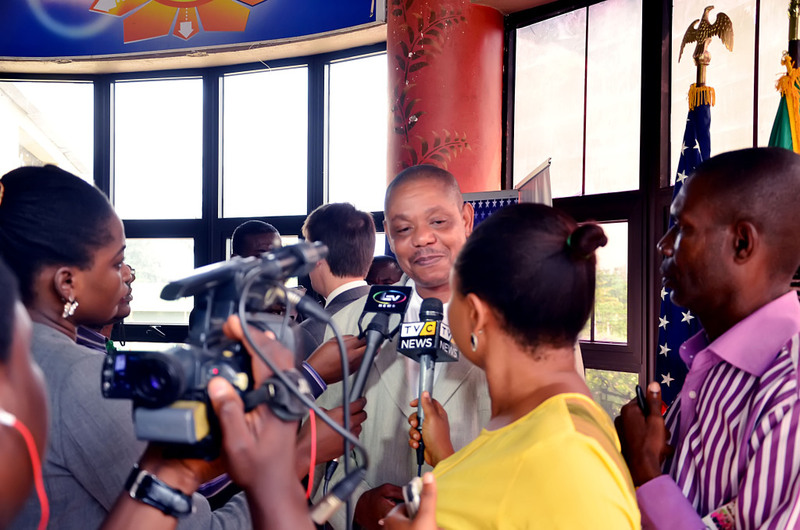 In conclusion Duker reaffimed the long running sustenabilty of the Abuja International Film Festival as it remains the Longest and most consistent Film Festival in Nigeria and Anglophonne west Africa, Insisting that other festivals came years after the establishment of the Abuja Film Festival in 2003. Promising an inspiring time for filmmakers and other participants this year.